I had a great time this past Friday getting to meet many potential law school students in the great Canadian city of Toronto. It was a busy time to be in town: the Toronto International Film Festival was taking place just blocks from the Law School Admissions Council host hotel, and I even spotted at least one movie star (my lips are sealed!). One of the many questions I got talking with forum attendees was about co-op and our international opportunities. NUSL is working to expand our international reach through the co-op program and increasingly students are going abroad to pursue co-ops. You can find more information about our international co-ops on the Co-op Services Website. We also have placed a renewed emphasis on our international law courses and opportunities (learn more about that here). While in Canada I also had a chance to explore the city’s Chinatown, Wellesley-Church neighborhood, the Distillery District, the area around Eaton Centre (especially the new Eaton Centre Urban Eatery – now that’s a fancy food court! ), and St. Lawrence Market. What a lovely city that reminded me of the walk-ability and neighborhood feel of Boston. 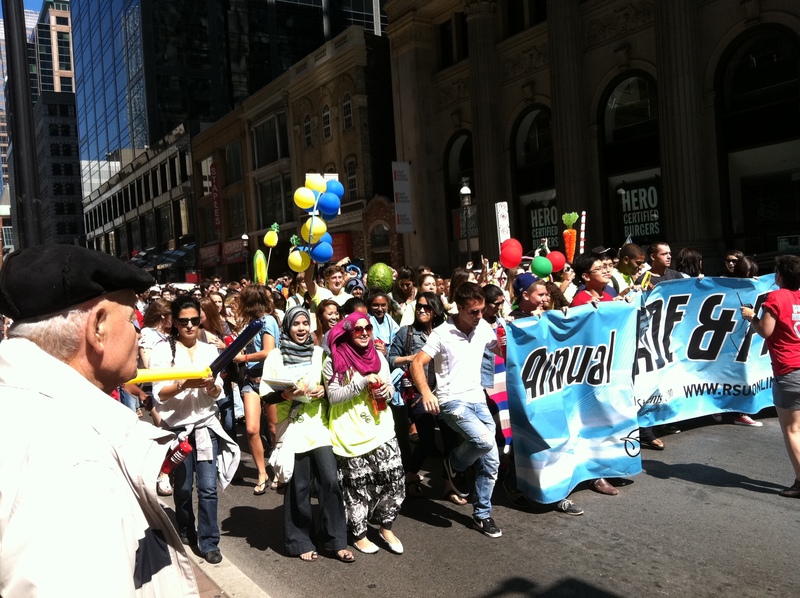 On Friday, while looking for something to eat near Eaton Centre prior to the law school forum, I literally ran into a group of Canadian university students parading the start of the school year. What fun! This entry was posted in Emily - Office of Admissions, Staff and tagged admissions, Canada, Co-op, Forum, international, LSAC, Toronto. Bookmark the permalink.